The car bearing the fake presidential Cacique Crown, an imitation of what is affixed to President of Guyana’s State vehicles. 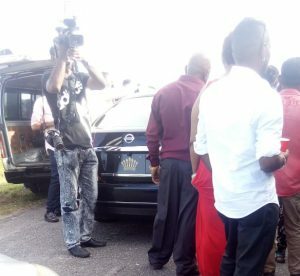 The President of the West Demerara Road Safety Association, who used two fake presidential crowns on a car at a wedding, was charged and fined. Peter Katahan, 43,a Rural Sergeant, was granted a total of GY$100,000 bail for five charges. He pleaded not guilty to fraudulent imitation of identification mark,and unregistered ,unlicensed,uncertified and uninsured motor vehicle. The offences were allegedly committed last Sunday at Hubu ,East Bank Essequibo. Police said Katahan, Bushy Park,East Bank Essequibo businessman, decided to affix two plastic crowns to his unregistered motor vehicle and reportedly used the said vehicle to transport celebrants of a wedding. A Vreed-en-Hoop Magistrate ordered him to return to court on August 13 at Leonara.